Shingles are known as the ‘herpes zoster virus', they are a relapse from the well known chickenpox virus. Shingles are seen mostly in young children, those with AIDS or any one over 50 who has a weakening immune system can be susceptible to getting shingles. If you have had chickenpox there is a chance in life as you get older you will experience the herpes zoster form come in a rash on the body. Shingles appear when the immune system lets any part of a previous cell of chickenpox loose into the bloodstream. The chickenpox virus never leaves the body, it sits in cells and if a cell lets it out you will get the infection. The shingles can appear on the abdomen back or face and are red bumps which later turn into painful blisters. Shingles looks very similar to that of a poison ivy rash, but will not itch and spread the same way. These bumps are small clustered blisters that can be very irritating and painful. The signs you may have shingles include prior itching and harsh pain along the body for no apparent reason. 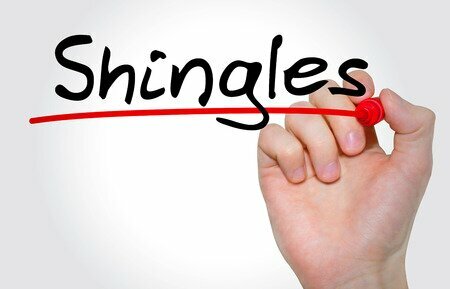 Tingling or a sensation close to that of being burned may also be a sign that you may see shingles. These symptoms will usually occur a few days prior to the actual outbreak of the shingles virus. Sometimes shingles can occur in the eye; this can later lead to blindness. It is very important you see a doctor if you notice a redness and swelling on the eyelids. To treat shingles you will need to go and visit your local doctor, it is extremely important to go to your doctor if the shingles appear anywhere on the nose or eye as this may spread and lead to a lot more harm to yourself. Be aware that shingles can be spread to others through the blisters as the chickenpox virus fills the blisters. Treat yourself as though you have chickenpox and avoid young children. There is really no known way to prevent shingles from occurring, the best thing to do is keep yourself healthy, live a safe life, and stay on top of things, if you notice anything happening go to your local doctor and ask about it, there is no harm in asking. Also if you do have AIDS, or any health disorders which may lower your immune systems guard, it is important to go to a hospital, as this can affect your body a lot more than someone who is at their peak of health. Shingles will not kill you, it is a small rash that will go away and in some cases you may experience pain for 30-90 days after the rash has cleared.